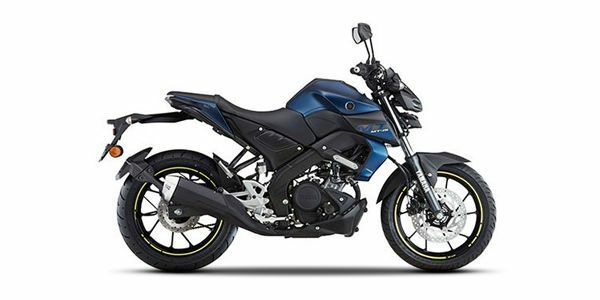 Yamaha has launched the MT-15 at Rs 1.36 lakh. This makes it around Rs 40,000 more expensive than the company’s other 150cc motorcycle, the FZ-15 and Rs 3,350 cheaper than the R15 V3.0. Bookings of the motorcycle have already commenced across Yamaha dealerships in the country, with deliveries scheduled to commence soon. At this price tag, the Yamaha MT-15 is placed as a more premium offering than its competitors, such as the KTM 125 Duke, Bajaj Pulsar NS200 and the TVS Apache RTR 200 4V ABS. The India-spec motorcycle misses out on quite a lot compared to its international counterpart. For starters, the India-spec model gets conventional telescopic forks instead of USD ones. In addition to this, things we found on the R15 are given a miss here like the dual-channel ABS setup and cast-aluminium swingarm. Yamaha MT 15 prices start at Rs. 1.36 lakh (Ex-Showroom). Yamaha MT 15 is available in 1 variants and 2 colours. The claimed ARAI mileage for the Yamaha MT 15 petrol is 48 kmpl. Q. Which bick is best FZ 2.0 and MT-15? Depends on what you want and your budget. If you want good mileage then go for the FZ. If you want a bit extra in power and performance then go for the MT. Personally I would recommend the MT. Q. WHICH IS BETTER, YAMAHA MT-15 OR PLUSAR NS 200? Q. I am 5feet 7inches tall. Would I be comfortable? Q. Which one is the best bike Yamaha R15 V3 or Yamaha MT-15? Is the MT-15 just another 150cc commuter, or is it a pukka little streetfighter worthy of the MT monicker? Top 5 Motorcycle News Of The Week: Yamaha MT-15 Launched, New Royal Enfield Bike Teased, Jawa Delivery Dates Announced, Hero Xpulse 200T Spotted And More!